My mom is a huge genealogy buff and has researched several branches of our family tree back to the 1200’s and beyond. She discovered that three of William Shakespeare’s grandparents were from our family tree! That section of the tree is so tangled that it gets really hard to wrap your mind around – instead of branching out, it is grafted back onto itself like a fancy topiary tree. Margaret Arden (1488) had a brother and sister (see yellow family) who married two of her kids (navy family). Two of those kids, Margaret Arden (1538) and Sir Alexander Webb, Sr., married and produced my ancestor, Sir Alexander Webb, Jr. (violet family). A fellow named Robert Shakespeare married Abigail Webb, another daughter of Margaret Arden (1488), and had a son, John Shakespeare (magenta family). John Shakespeare married Mary Arden, his first cousin and first cousin once removed, and had a son, William Shakespeare (rose family). SO: William Shakespeare and my ancestor, Sir Alexander Webb, Jr., were: first cousins*, quadruple second cousins*, and quadruple second cousins once removed*. William Shakespeare’s grandmothers were sisters, Mary and Abigail Webb (navy family). Abigail married Robert Shakespeare (magenta family) and Mary married her uncle, Robert Arden (chartreuse family). Mary Webb and Robert Arden (chartreuse family) were Shakespeare’s grandparents and also the grandparents of my 15-generations-back ancestor, Sir Alexander Webb, Jr. SO: William Shakespeare was my first cousin 15-times removed* (and many other odd connections through the tangled tree). If you look at the blank Shakespeare branch of the family tree (red family and beyond), you’ll see how many ancestors each person in that column should have. But William Shakespeare’s other three grandparents are from the same family and so they share one set of ancestors. Essentially, Shakespeare’s genetic diversity was half as much as it should have been (two grandparent family lines, instead of four). And my ancestor, Sir Alexander Webb, Jr., had only a quarter the genetic diversity he should have had! 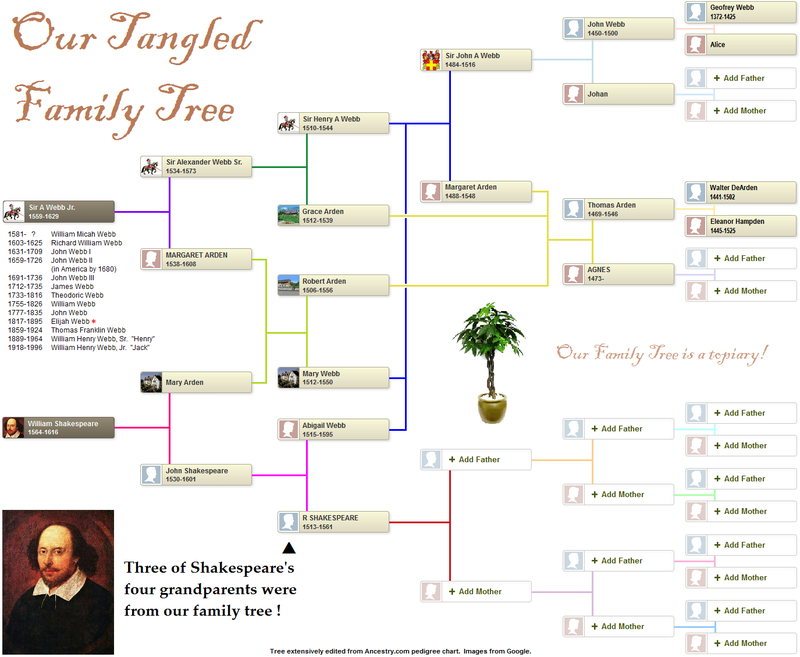 Now, I don’t know if this level of intermarriage was commonplace or if it was just such a small town that they didn’t have a choice – But one has to wonder if this tangled family tree may have contributed somehow to Shakespeare’s literary genius. Aunt/Uncle and Niece/Nephew: The aunt/uncle’s sibling is the parent of the niece/nephew. Grace Arden is the aunt of Henry Webb because her sister (Margaret Arden (1488), yellow family) is his mom (navy family). Robert Arden is the uncle of Mary Webb because his sister (Margaret Arden (1488), yellow family) is her mom (navy family). First Cousins: They share one set of grandparents because they have parents who are siblings. John Shakespeare and Mary Arden are first cousins because their moms were sisters (Mary & Abigail Webb, navy family) so they share a set of grandparents (John A. Webb & Margaret Arden (1488), navy family). William Shakespeare and Alexander Webb, Jr., are first cousins because their moms were sisters (Mary & Margaret (1538) Arden, chartreuse family) so they share a set of grandparents (Robert Arden & Mary Webb, chartreuse family). Double First Cousins: They share two sets of grandparents because their parents are siblings married to siblings. Alexander Webb, Sr., and Margaret Arden (1538) are double first cousins because their parents are siblings (Grace & Robert Arden, yellow family) married to siblings (Henry & Mary Webb, navy family) so they have the same two sets of grandparents (Thomas & Agnes Arden, yellow family, and John A. Webb & Margaret Arden (1488), navy family). First Cousins Once Removed: The “once removed” refers to a change in generation – So, one has a parent that is the first cousin of the other (EX: You and your dad’s first cousin are first cousins once removed.). Alexander Webb, Sr., and Margaret Arden (1538) are first cousins once removed because his dad (Henry Webb, hunter family) is her first cousin … because they (Henry & Margaret (1538)) have parents who are siblings (Margaret (1488) & Robert Arden, yellow family). Alexander Webb, Sr., and Margaret Arden (1538) are ALSO first cousins once removed because her mom (Mary Webb, chartreuse family) is his first cousin … because they have parents who are siblings (Margaret (1488) & Grace Arden, yellow family). John Shakespeare and Mary Arden are first cousins once removed because his mom (Abigail Webb, magenta family) is her first cousin … because they have parents who are siblings (Margaret (1488) & Robert Arden, yellow family). Second Cousins: They share one set of great-grandparents because they have parents who are first cousins. William Shakespeare and Alexander Webb, Jr., are second cousins because their dads (John Shakespeare & Alexander Webb, Sr.) are first cousins … because they (John & Alexander, Sr.) share a set of grandparents (John A. Webb & Margaret Arden (1488), navy family). William Shakespeare and Alexander Webb, Jr., are ALSO second cousins because William’s dad (John Shakespeare, rose family) and Alexander, Jr.’s mom (Margaret Arden (1538), violet family) are first cousins … because they share a set of grandparents (John A. Webb & Margaret Arden (1488), navy family). William Shakespeare and Alexander Webb, Jr., are ALSO second cousins because William’s mom (Mary Arden, rose family) and Alexander, Jr.’s father (Alexander Webb, Sr., violet family) are first cousins … because they share a set of grandparents (John A. Webb & Margaret Arden (1488), navy family). William Shakespeare and Alexander Webb, Jr., are ALSO second cousins because William’s mom (Mary Arden, rose family) and Alexander, Jr.’s father (Alexander Webb, Sr., violet family) are first cousins … because they share a set of grandparents (Thomas & Agnes Arden, yellow family). Second Cousins Once Removed: One has a parent that is the second cousin of the other. William Shakespeare and Alexander Webb, Jr., are second cousins once removed because William’s dad (John Shakespeare, rose family) is the second cousin of Alexander, Jr. … because they (John & Alexander, Jr.) share a set of grandparents (Thomas & Agnes Arden, yellow family). William Shakespeare and Alexander Webb, Jr., are ALSO second cousins once removed because William’s dad (John Shakespeare, rose family) is the second cousin of Alexander, Jr. … because they share another set of grandparents (Thomas & Agnes Arden, yellow family). William Shakespeare and Alexander Webb, Jr., are ALSO second cousins once removed because William is the second cousin of Alexander, Jr.’s dad (Alexander Webb, Sr., violet family) … because they share a set of grandparents (Thomas & Agnes Arden, yellow family). William Shakespeare and Alexander Webb, Jr., are ALSO second cousins once removed because William is the second cousin of Alexander, Jr.’s mom (Margaret Arden (1538)., violet family) … because they share a set of grandparents (Thomas & Agnes Arden, yellow family). NOTE: Ancestry.com can’t lay out the tree above, instead inserting the same person into more than one place in the tree. So, to make the image above I had to take screen shots of the Ancestry tree and rearrange things, using different colored lines to represent core families of parents and children. I think it’s fun to know this. And it does account for your gift of gab, LOL. Well it looks like you and I might be related through this crazy topiary tree. No wonder I was having such a hard time on Ancestry trying to understand what was going on. I show my 18th GG Grandmother Margaret Arden was Shakespeare’s GG Grandmother and her son Sir Henry Alexander Webb was his great uncle? You did an amazing job explaining what was going on. I hope you email me, maybe we can compare notes.